To peel the peaches, lower them a few at a time into boiling water for a minute or so, and immediately refresh them in a bath of ice water. When cool, use a paring knife to remove the skins, which should come off easily. Cut the peaches in half and remove the pits. If you have cling peaches (rather than free-stone), the flesh won't slip away from the pit to make nice halves, so you'll need to cut the fruit off the pit. To make the pickling solution, combine the water, vinegar, wine, honey, peppercorns, cloves, allspice, cinnamon and bay leaf in a heavy-bottomed pot or saucepan. Bring to a boil, reduce the heat and simmer for 5 minutes. Add the peach segments and cook just until tender, 3 to 5 minutes: test with a toothpick or sharp knife. (Make sure the peaches are cooked through or they will turn brown.) 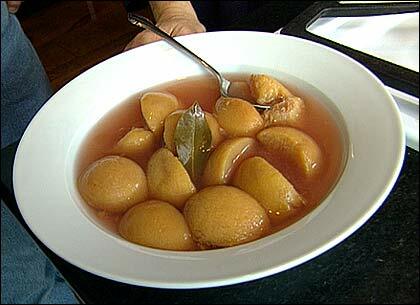 Carefully remove the peaches with a slotted spoon; they will be quite delicate. Let the pickling mixture cool slightly and then strain over the peaches. Cover and refrigerate overnight or for up to a week. Please note: Peach leaves can be toxic and should not be used in this recipe.